No recording of this homily available. In the space left by the nave altar; an image has appeared. A sign…a symbol…a tool…a path. This is a labyrinth. It’s our canvas labyrinth, and it will be here every Sunday of Advent, and I encourage you to make use of it either before or after church. Some of you may be familiar with it, or with other labyrinths. There is one at Boston College that is a copy of the one at Chartes Cathedral. BC labyrinth guide. There is a small one in the gardens of Bethany House, in Arlington. There is one at Harvard Divinity School. There’s one at Simmons College. There’s now one on the floor of the Episcopal Cathedral downtown. There’s one down on the Greenway at the Armenian Heritage Park. Labyrinths come in many forms, are often ancient in design. The oldest surviving labyrinths date back to around 2000 BCE. It is a symbol that is found in various ways in virtually every religious tradition. It is a map. A map, not of actual terrain but of the archetypal cosmic journey into and out of the center of all being. It is a map, but a highly unusual one in that it’s not a map you look at and study and then hope you remember when you go out into the world. It’s a map that you can actually walk—it’s a symbol that allows you to enter fully into…winding down into the depths—or up to the heights—and then spiraling, unspooling, back out into the world changed by the journey. It is a map…a blueprint; not a maze. There is only one path…and it leads to the center and then back out again. 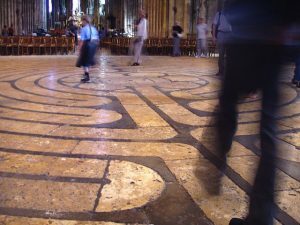 You can’t actually get lost walking a labyrinth…however…you can feel lost very quickly. Which is one of the lessons it teaches. The first few steps are always right towards the center…the center is—God, Jesus, the New Jerusalem, our truest self, our soul, it’s the place we long to be…and everyone starts heading in that direction…and then, not many steps in…you turn. This always happens. We start out in one direction…and then something happens. Maybe it’s some life event, maybe it’s Gospel passage about “the end times” that’s hard to understand…maybe it’s somebody saying or doing something that hurts…whatever it is, we turn away from the center, and find our selves turning again and again and again…sometimes moving towards the center…sometimes moves away from it…very often not sure whether we’re getting closer or further away. Others walk with us and it’s impossible to know (unless you’ve been watching them the whole time, or they pass you) whether they are walking into the center or out of the center…whether they are going the same direction as you or not. This is true of life as well…when we meet someone, we can’t know, on first glance, where they are in their journey. We can’t know where we are in relation to them. Unless we engage with them…open up…”have you been past this point?” “Oh, yeah, me too.” “Oh, not yet? Ok well, take care…” “oh you’re coming back from the center…what’s it like?” All we can be sure of is that we are all somewhere on the same path. When walking with others there are times when you walk side by side, and at other times you are walking far away from each other. There is a constant weaving in and out. This is true in life as well. Sometimes we are very close to one another, and walking alongside them, and then there a turn or two later and you’ve drifted apart…even though you’re still walking the same path…We are rarely in the same place. And maybe the most significant…The road there and back again…the road to the center of everything and back to the edges of everywhere…is long, circuitous, and sometimes difficult. And the only way to get there is one step at a time. There are no short-cuts. You lose track of where the center is, or why you thought you wanted to go there? Keep going. It’s long and slow and boring? Keep going. It’s taking too long…you’ve got better things to do…there are things happening in the world that are troubling and distracting? Keep going. One step at a time. That’s the only way to get there. I know many of you have used this labyrinth in the past, and I wanted to make this map, this tool, available to all of us this Advent, because I think it has much to teach us as we move into the new year. This coming year we will be walking together much more deeply into an understanding of how the sin of racism affects all of us…how we have manifested it in our own lives…and how we might begin to liberate ourselves from its grasp. There will be plenty of twists and turns for all of us in that work. Times when we walk apart…times when we doubt what we’re doing…keep going…trust that this is the path. This coming year will also be one for engaging in some deeper listening and sharing about where we are in our own spiritual walks…where members of our wider community are…and what the path forward for all of us might look like. We will walk some of this year together, and some of it apart. This coming May I will be going on sabbatical for three months, returning in September. Members of the vestry and I have worked (and will continue to work) on the sabbatical plan which uses a labyrinth as a framing device…each section of my time away will be focused on moving into and out of a particular spiritual center and location, and it will involve a good deal of sacred walking. The invitation for you is to explore, and find ways of renewing and deepening your own practices. And the labyrinth is a great way to do that…as one of the great teachers of the practice says, it can help quiet your mind, open your heart, ground your body…you might find answers to long asked questions…you might find some healing…some creativity…some sense of wholeness…[source], but you have to walk it…you have to practice. And so, as we enter this period of watching and waiting…this time of endings and beginnings…this time of gathering darkness and glimmering hope…I invite you to try this tool…to explore this map…this blueprint…this “archetype of wholeness” [source], and pray that using it can help you rediscover the depths of your soul. It will be available to walk before and after church every Sunday of Advent, and during the Quiet Day next Saturday. There are resources on the tables around the labyrinth. And may you have a blessed and fruitful Advent.